Lanna and Edmund chat about Magic the Gathering, Dominion and other games. Lanna announces she is cheerfully depressed. They explain why they haven’t podcasted since January and talk about the grieving process. And woods funk. There be woods funk. On your phone? 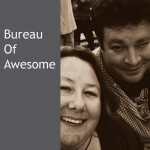 Visit our Mobile site at: BureauOfAwesome Mobile Now even smarter for your smart phone!